When the Rock n’ Roll Hall of Fame announced 2013’s inductees, one name stuck out to me as well deserving of the honor. That’s not to say that I am not happy for Rush, Heart, and the other bands and artists who are being inducted, but The Velvet Bulldozer stands out. Albert King (one of the 4 kings of blues guitar) will be posthumously inducted into the Hall, and, if he was still alive today, I’m sure he would accept it with amicable poise. 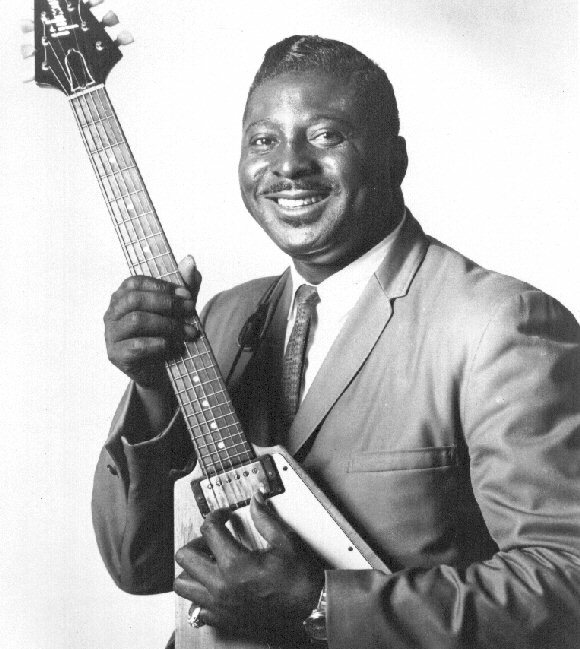 Before we talk a little bit about Albert King’s impact on music, it is important to know that King was a true musician. He was a wonderfully kind individual and when he hit the stage he put all things aside and just played music. He loved music. He loved the guitar. His passion for melody and harmony was apparent in his playing, and his infectious, friendly personality made him beloved on and off the stage. King’s career traversed the 1960s. He first played professionally with The Groove Boys from Arkansas and then moved around the midwest during the 1950s hooking up with various musicians and labels. What remained consistent was his Flying V guitar (as you see above) which, like George Harrison, he named Lucy. Classic electric blues. King’s voice is velvety with excellent vibrato. His guitar skill is evident. The man knew how to get feeling out of his Lucy, and his clean, bright and whiny playing style has been imitated by those he has inspired (Derek Trucks, Joe Walsh, etc.). After the release of The Big Blues, King’s popularity continued rising in the Midwest and, in 1966, he rode that popularity to Stax records where he signed in 1966. There, with the widely influential Booker T & the MGs, he recorded premier blues tracks, including his most famous track, “Born Under a Bad Sign.” The track, also the name of his first album with Stax, helped propel him to all of America and other countries. “Born Under a Band Sign” is a unique song because of King’s unique guitar, which bathes ears with an authentic twang. The looping bass line carries the song, and the horns further accentuate the song’s comfortable bluesy power.